It's a holiday delivery of improved payouts from two pharmaceutical giants, plus a famous name in payment cards. Income investors will find it hard to bid goodbye to 2015. The year was stuffed full of dividend raises, with a great number of stocks hiking their payouts, in many cases substantially. 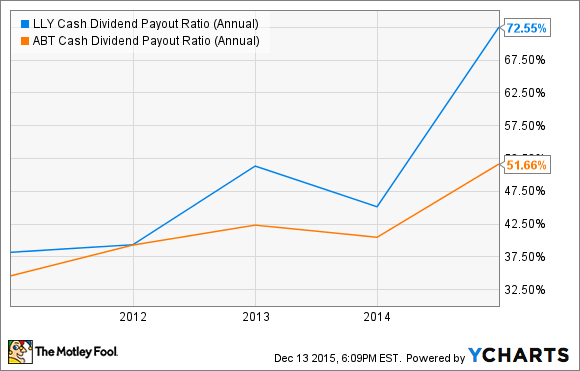 Luckily for us dividend lovers, we still have a bit of time before 2015 comes to a close. Last week, entirely in character, the market graced us with a healthy set of increases; as usual, I've selected three notables for this installment. Here's to hoping we get a last batch of raisers before popping open the New Year's Eve Champagne. Ring up another dividend hike for purchase card processing giant MasterCard (NYSE:MA), which last week increased its quarterly payout by 19%, to $0.19 per share. That sounds major, but it's actually a fairly modest raise by the company's usual standards. 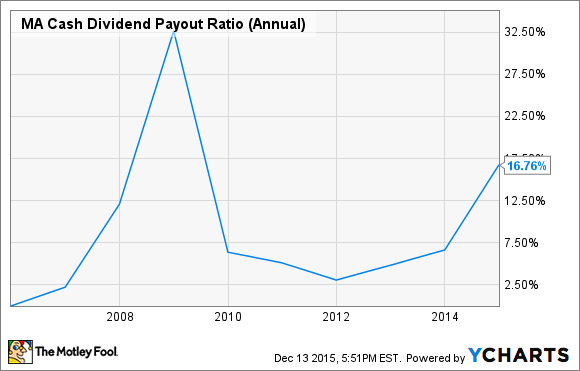 It tends to hike its dividend every year around this time, and previous increases have been higher. Last year's was 45%, while the company doubled the payout in 2013. High and sustained profitability helps fuel these growing dividends. In its Q3, MasterCard maintained its top and bottom lines despite a strong U.S. dollar that has sapped growth for some American multinationals. The company kept net profit more or less steady at $977 million (from Q3 2014's $1 billion), while incrementally upping its revenue to $2.5 billion. The company's free cash flow is very robust, over $3.2 billion in fiscal 2014, but it dispensed a comparatively light $515 million in total dividends that year. This equated to a very low cash dividend payout ratio (the percentage of free cash flow used for distributions) in the mid-teens. MA Cash Dividend Payout Ratio (Annual) data by YCharts. All in all, even at the new, raised amount, MasterCard's distribution yields a wafer-thin 0.8%. 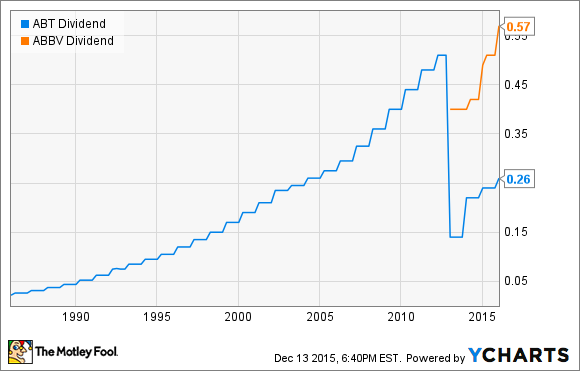 That's well below the current 2.1% average yield of stocks on the S&P 500 index. So investors shouldn't worry at all about the sustainability of that payout. After all, it's rather miserly when taking into account the company's considerable financial resources. MasterCard's new dividend is to be paid next Feb. 9 to stockholders of record as of the preceding Jan. 8. This sturdy pharmaceutical giant is a Dividend Aristocrat, one of the very few stocks that have raised their payout at least once annually for a minimum of 25 years consecutively. Abbott Laboratories' (NYSE:ABT) latest quarterly dividend hike is its 44th in a row (when taking its 2013 spin-off of AbbVie into account), and shakes out in an 8% raise, to $0.26 per share. ABT Dividend data by YCharts. Like MasterCard, Abbott Laboratories has proven to be very resilient in foreign markets. In fact, it was revenue from abroad that pushed the top line incrementally higher on a year-over-year basis (to $5.2 billion) in the most recently reported quarter. Key foreign locales such as Russia, India, Brazil, and China turned in growth for the company. Meanwhile, the bottom line saw a bigger advance, by nearly 8% to $580 million. Both line items beat average analyst estimates. Over the years, the company has traditionally been fairly conservative in its cash management, disbursing 50% or less of its annual free cash flow as dividends. I see no reason to believe it will quit the habit; this tendency, combined with those improving results, should allow Abbot Laboratories to keep up those annual dividend hikes well into the foreseeable future. The company's next distribution will be handed out next Feb. 16 to stockholders of record as of Jan. 15, 2016. Elsewhere in the pharmaceutical sector, Eli Lilly (NYSE:LLY) declared a comparatively modest raise in its quarterly dividend, by 2% to $0.51 per share. That caution makes sense because, on the back of key patent expirations (among other blows), the company has had its struggles. In fiscal 2014, for example, the company's revenue slid by 15% to land at just under $20 billion. Net income suffered a queasier decline, by nearly 50% to $2.4 billion. Meanwhile, Eli Lilly's annual cash dividend payout ratio has climbed to a relatively high 73%, after several years of hovering in the 45% to 55% range. Peer pharmas such as Abbott Laboratories have more successfully managed to stay within or below that latter band. LLY Cash Dividend Payout Ratio (Annual) data by YCharts. That's not to say the future is necessarily gloomy. Eli Lilly has several promising treatments in the pipeline, such a potential blockbuster it's developing to fight Alzheimer's that's shown some encouraging results (albeit with a setback or several) in recent clinical trials. So, better times probably lie ahead for the company. I think its results will improve, and hence that cash dividend payout ratio will come down to levels more typical of the broader pharma sector. Hopefully, this will fuel more substantial raises to the dividend in the future, keeping the company on pace with some of its fellow big pharma players. Eli Lilly's new dividend is to be paid next March 10 to shareholders of record as of Feb. 12.